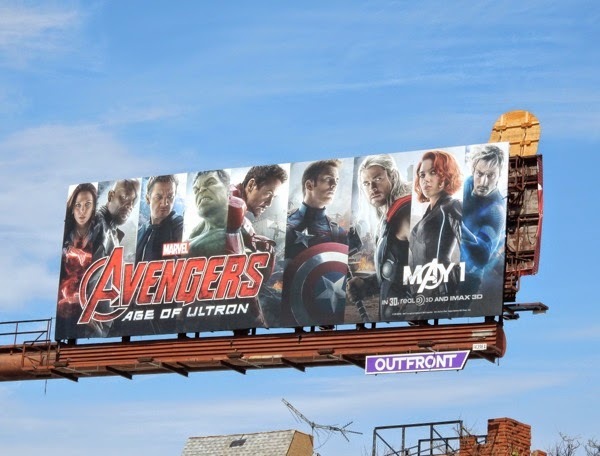 Just how many of Earth's Mightiest Heroes can you fit onto a billboard anyway? 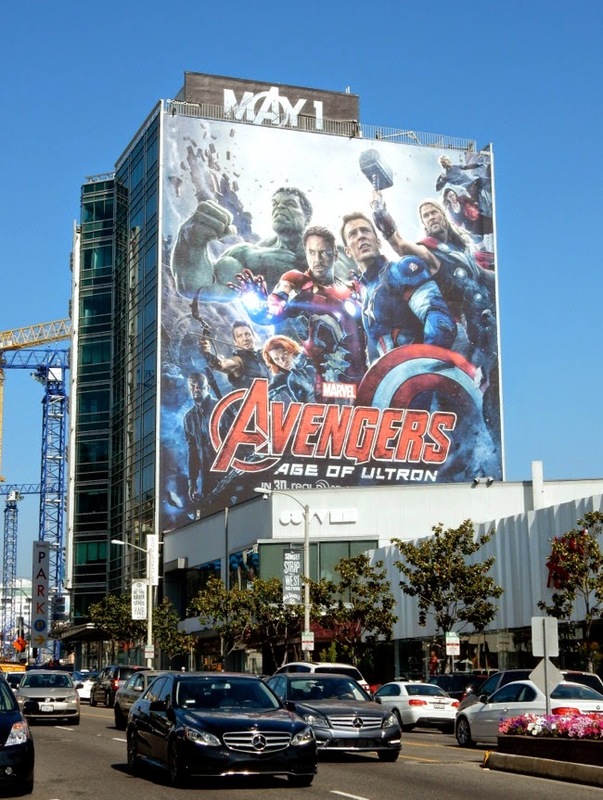 This many apparently, for Marvel's Avengers: Age of Ultron. 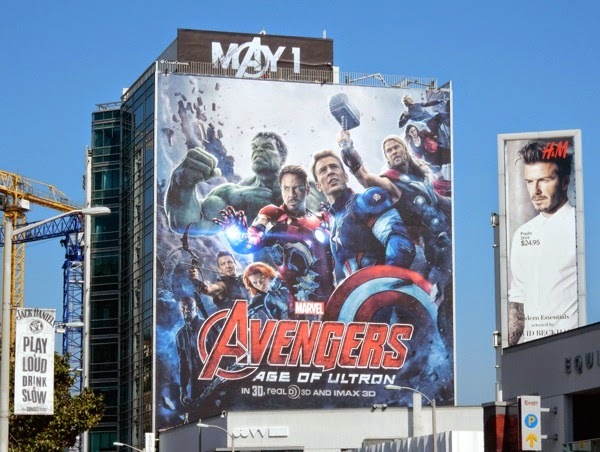 This May it's time for the Avengers to assemble once more to take on the threats that no single superhero can stand against and this time it's a doozy - enter the maniacal artificial intelligence, 'Ultron' (voiced by The Blacklist's James Spader). After the collapse of S.H.I.E.L.D. in Captain America: The Winter Soldier and a fun romp in space courtesy of those oddball Guardians of the Galaxy, it's time to return to the Marvel Cinematic Universe and unite the heavy hitters once more. Rather than in the Marvel comic books where 'Hank "Ant-man/Giant-Man/Goliath/ Yellowjacket" Pym' invented the A.I. intent on eradicating humanity, this time it looks like it's 'Tony Stark' aka 'Iron Man' who has created their arch-foe, with the best of intentions to build a suit of armour around the world to protect its inhabitants. Fortunately he has a few super-friends who have already helped him repel an alien invasion in New York City and it's time to call in some favours to right some wrongs. 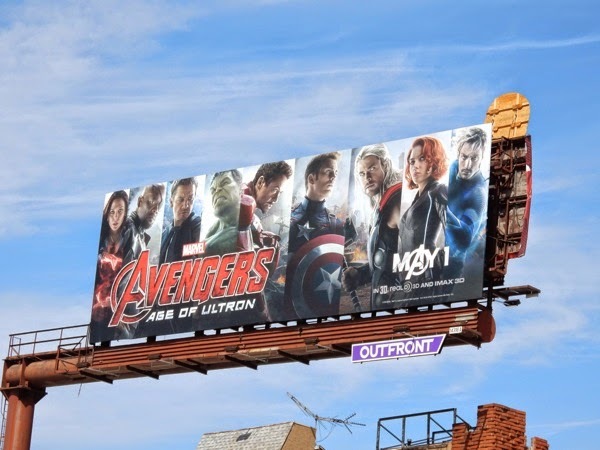 'Captain America' leads the team of heroes including 'Thor', 'Black Widow', 'Hawkeye' and 'Hulk', with a little help from their super-spy 'Nick Fury'. Plus from the looks of things the gifted twins, probability altering 'Scarlet Witch' (Elizabeth Olsen) and speedster 'Quicksilver' (Aaron Taylor-Johnson), will be on hand to cause some trouble before they see the error of their ways and join the mighty assemblage of heroes to defeat Ultron (and more foes besides no doubt). 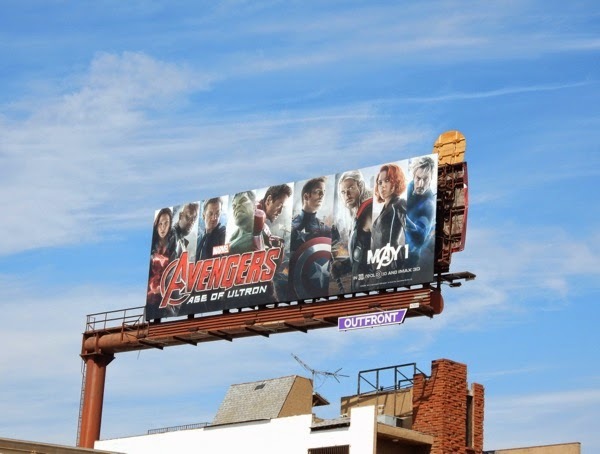 And one fan-favourite newcomer not shown in these billboards is the 'Vision' (to be played by Paul Bettany who has voiced the J.A.R.V.I.S. system in the Iron Man movies), so all of a sudden the Marvel universe is feeling a little more crowded, so let's hope director Joss Whedon can do all the characters justice. 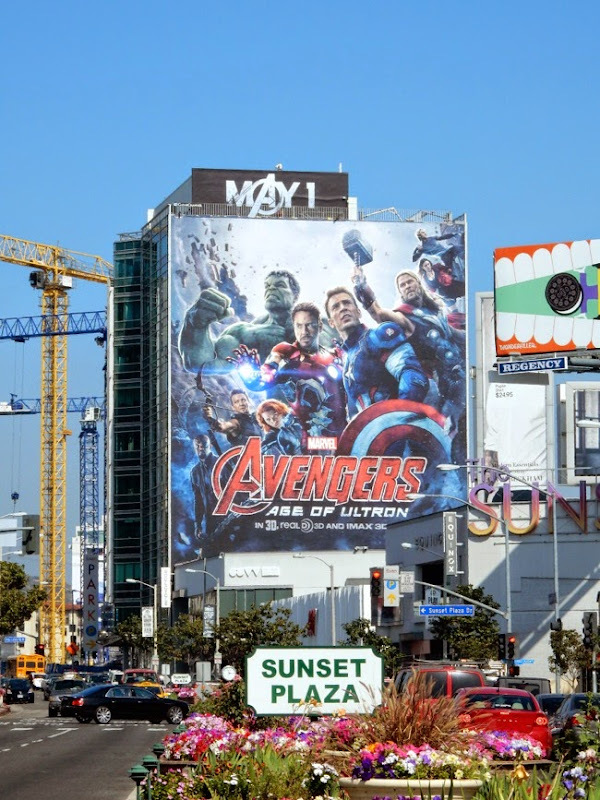 The film Avengers movie made over $1.5 billion at the box office globally, so it's not like there's any pressure to deliver a satisfying story. 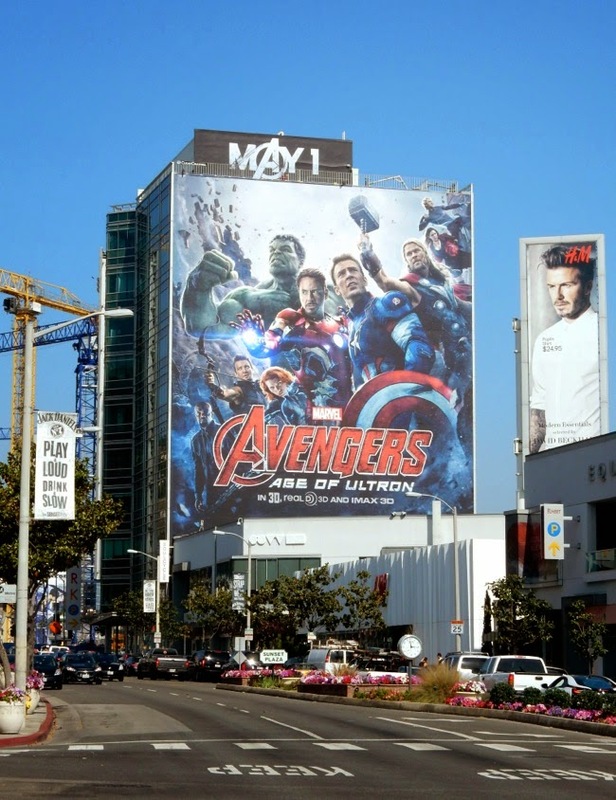 This super-sized Avengers: Age of Ultron movie billboard was snapped dominating the skies over L.A.'s Sunset Plaza on March 19, 2015, whilst the standard landscape billboard was spied further west along Santa Monica Boulevard the same day. 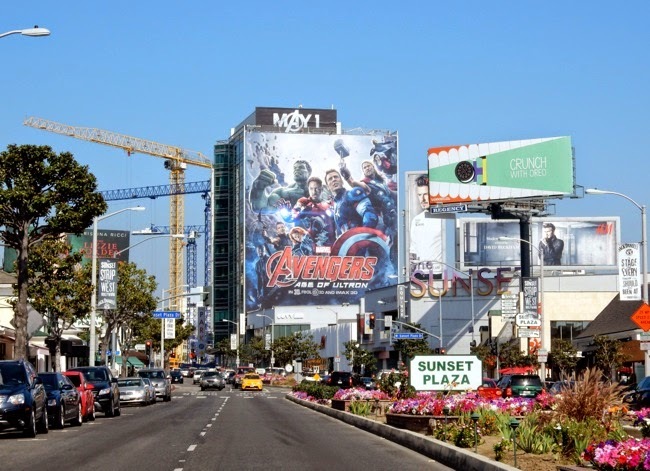 Daily Billboard is sure an onslaught of outdoor ads will soon appear as we near the movie sequel's release date, but we couldn't help but share these heroic ad creatives to get you all excited for May 1, 2015. 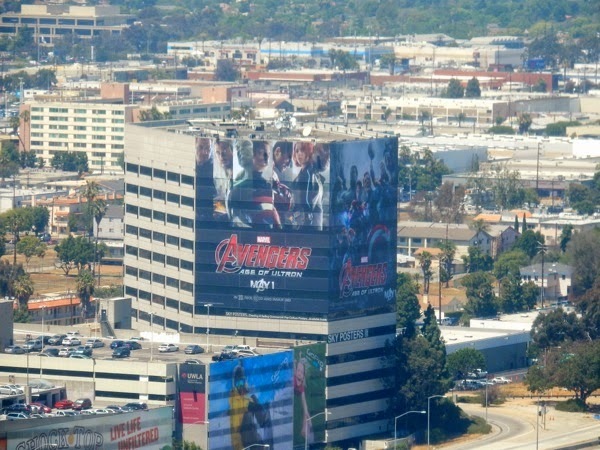 If you're a superhero fan, be sure to also check out these other supercool Marvel Comics movie and TV show billboards that have filled L.A.'s skyline in recent years. 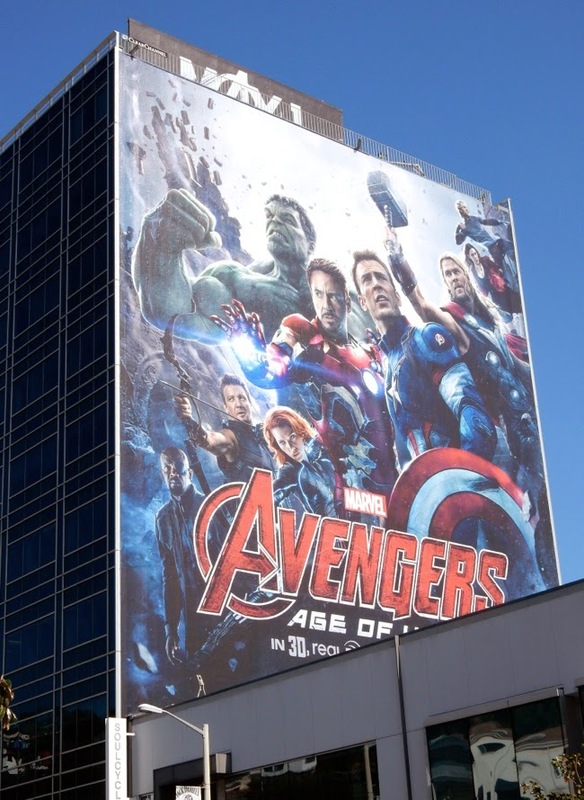 UPDATED: Be sure to also check out these original Avengers: Age of Ultron movie costumes on display. 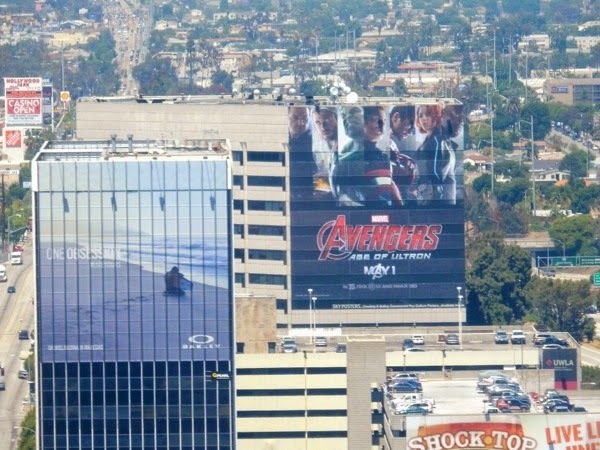 Plus here are two other super-sized billboards for the Avengers sequel along the 405 freeway spied while landing at LAX airport on April 28, 2015.